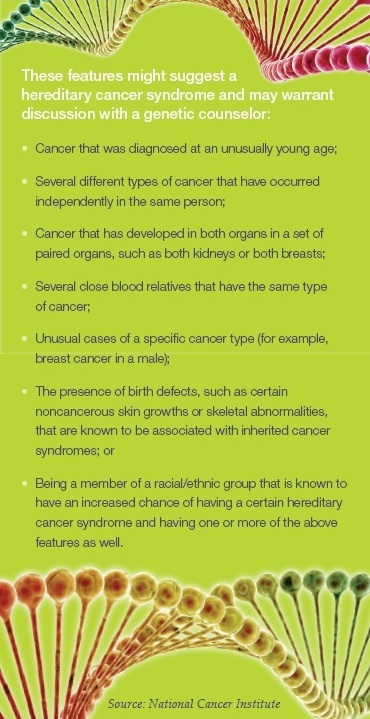 A person’s medical and family history often hold clues about an increased cancer risk or an inherited cancer. Inherited genetic mutations play a major role in five to 10 percent of all cancers. Many of these genetic mutations have now been identified, and genetic testing can usually confirm whether a condition is, indeed, the result of an inherited syndrome. Many experts recommend genetic testing should be considered a) when someone has a personal or family history that suggests an inherited cancer risk condition; b) when the test results can be adequately interpreted; and c) when the results can provide information to help guide a person’s future medical care. Anyone considering genetic testing should speak with a trained genetics professional before deciding whether to go through the process. Genetic counseling includes a detailed review of the individual’s personal and family medical history related to possible cancer risk. Counseling also includes discussions about such issues as the medical implications of a positive or a negative test result, the possibility that a test result may not be useful in making health care decisions, the psychological risks and benefits of learning one’s genetic test results, and the risk of passing a genetic mutation (if one is present in a parent) to children. Genetic testing is not right for everyone, and the test itself has limitations. It does not always provide a simple “yes” or “no” answer about hereditary cancer risk within a family. Learn more. The experts at Mercy Cancer Center can help determine if you are a good candidate for genetic testing, and ensure results are interpreted and explained correctly. Contact Mercy Cancer Center at (515) 643-8206 for more information.